The 2016 Hyundai Tucson is absolutely perfect for anyone wanting an SUV that gets great gas mileage and at a reasonable price. I loved the Tucson I recently had for a week. The 2016 Tucson Eco AWD gets 26/33 mpg. Which is fantastic for a crossover. All at a fantastic price. The Eco that I test drove starts at $24,150. The basic Tucson starts at just $22,700 though. A very affordable option. The Tucson has some wonderful features. It has a Hands Free Smart Liftgate (on the Sport and Limited models). When the proximity key is within 3 feet of the trunk for more than three seconds, the trunk automatically opens. An awesome feature when your hands are full. Also features the Proximity Key entry on the Sport and Limited models. Side Mirror Mounted Turn Signal Indicators on the Eco, Sport and Limited body's. And a push start of course! 8 Way Power Driver Seat with Lumbar Support is standard on most models. Visit here to find out all the features for different models. I really liked the look of the Tucson, it was simple with not too many things to get confused about, but was sleek and nice in design. 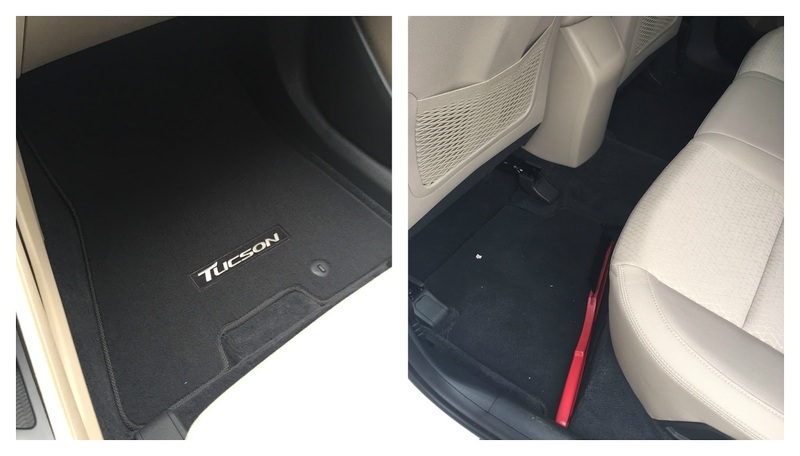 The Tucson is a 5 seater, but there's lots of room in the backseat and in the cargo trunk as well. Trunk with 2nd row up and folded down. Lots of storage space with a 60/40 split seat. The Hyundai Tucson is one of their entry level crossovers, so the features are pretty basic. It's not until you get into the Sport and Limited that you have more options, like the Lane Change Assist and Lane Departure Warning, as well as Rear Parking Sensors LED Headlights, Dual Front Temp Control, Heated Front AND Rear Seats and more. The one I test drove didn't have any of that, but they are options or standard on the Sport and Limited Models. Overall the Tucson was a fun drive. It was smaller and comfortable, lots of space in trunk, affordable, great gas mileage and it had just enough fun features to keep me entertained and happy! I would definitely recommend the Tucson for anybody looking to get a new vehicle that is affordable. But if you can afford a little more, I'd recommend the Santa Fe!